Arrow drawing in DXF format. Charles Detriche has kindly allowed me to publish one of his IOM designs. This one is called "Arrow". Update 2011 March 16: By popular demand, forward and aft 1:1 sections for printing on A4 paper: arrow_fwd_shadows_2011mar16 and arrow_aft_shadows_2011mar16. Congratulations on the new site. It looks fantastic. Thanks Tony, I think a blog-format website should work OK for archiving all the bits and pieces of information that I have accumulated on various websites over the years. Congratulations on the boat design! We need free contributions like this in Brazil. after returning from Toulouse (France) recently I have become interested in the Arow as shown on your website. I had the god fortune to sail several of them at the local club and I was thiking it make make a good generic IOM for my local club here in Sydney Australia. 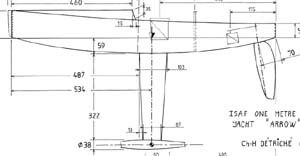 I am concerned thqt the displacement on the drawing is stated as 3.78kgs? With an al up weight of 4kg's would it sit a little to low in the water. The 3.78 kg corresponds to the volume of the hull shell only. 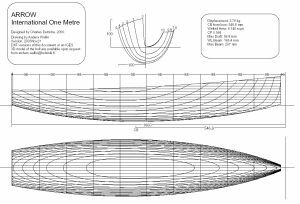 The fin and the rudder will displace some additional volume, but I haven't got the calculation here right now..
most bulbs are not pure lead, I've measured about 10.5kg/m^3 for the alloy we use - so you should be fine displacement wise.